l Power wash the outside of the house. If you have loose, peeling, cracking paint, you’ll need to have the place painted. l Power wash the windows outside and clean them on the inside. l Clean out gutters and replace if they’re rusty, bent or look old and in disrepair. l Rake up leaves and dead vegetation and dispose of it. l Keep the lawn mowed throughout the sales process. Make sure sidewalks and walkways are edged neatly. l Get rid of weeds, dandelions and grass growing up through the driveway or sidewalks. l Trim trees so that no limbs are touching the roof. l Put bikes, skateboards and scooters in the garage. l Trim back unruly, unkempt bushes. l Install low-wattage ground lights along the front walkway. l Plant bright-colored flowers and keep them watered and looking beautiful. Remove wilted dead blooms religiously. 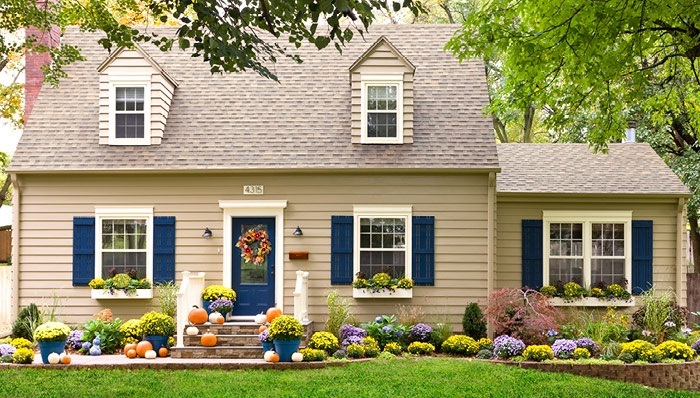 l Give your front door a fresh coat of paint or replace it. l Apply large, clearly visible house numbers to the front of your house. l Keep garbage barrels in the garage out of sight. l Power wash your deck or patio and sand and stain if necessary.